When I posted the photo and story about the freakish Strange Seeding Strawberry the other day, a lot of people asked what was going on and commented that they’d never seen anything like it. But no one could shed any light on the mystery. 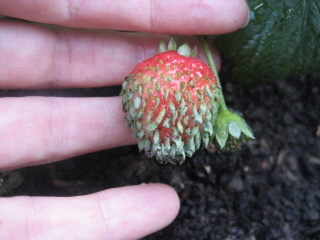 See, typically strawberry seeds need to overwinter (a.k.a. 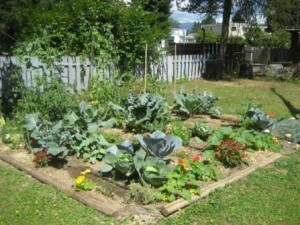 freeze) in order to germinate. Having them germinate on a strawberry that was still attached to the plant seemed more than a little unusual. Well, I’m all about local so I decided to give our very own Driedeger Farms, a local strawberry farm dating back to the mid-1940’s, a chance to weigh in on the topic. Rhonda responded to my query asking a few identifying questions that I couldn’t answer about what kind of strawberry it was. “Uhm, a red one” was about as specific as I could be. I can cut Rhonda some slack given that strawberries naturally propagate via runners and on a 65 year old farm it’s not likely they’ve needed to rely on seeding in quite some time. 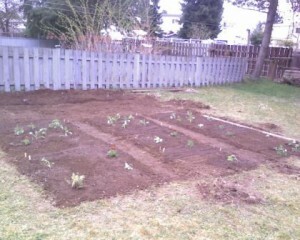 But it still doesn’t explain why a strawberry that has neither been frozen nor planted in soil, sprouted on the vine. This entry was posted in 16 Oaks Community Garden, Urban Gardening and tagged runners, seeding, strawberries, strawberry on September 3, 2010 by local delicious. One of my garden neighbours has a strawberry that has begun to sprout. Not the plant, the actual strawberry. Neither of us has ever seen anything like it, and I must say it’s a rather strange sight. Each of the seeds on the outside of the strawberry has a green shoot extending out of it, giving it the appearance reminiscent of a just sprouted Chia Pet. Frankly, it looks quite alien. 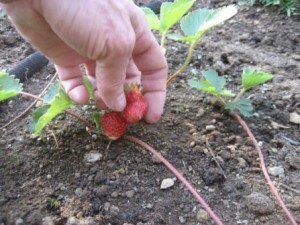 Normally, strawberry seeds can only be activated or germinated after they’ve been frozen/wintered. The fact that this one’s seeds all spontaneously sprouted in relatively warm weather is unusual. 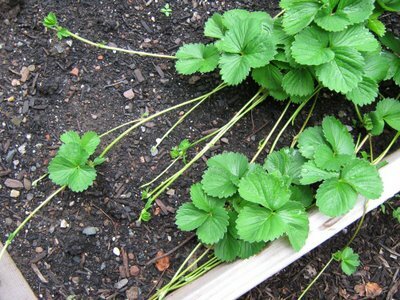 I’ve not found anything in my online search travels to explain what happened or whether you can plant the strawberry like this and grow it successfully. If you’ve ever encountered this, I welcome your comments. 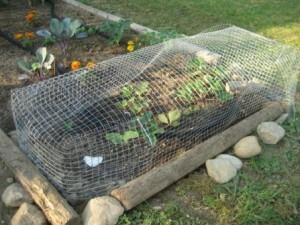 This entry was posted in Urban Gardening and tagged strawberries, strawberry on August 22, 2010 by local delicious.